Ken Januski is an artist living and working in Philadelphia, PA, USA. His artistic education was almost entirely as an abstract artist, tempered only by many years of figure drawing and by many hours spent in museums, especially the Art Institute of Chicago. The bulk of his artistic training took place at University of California, Berkeley, a location that also allowed him to haunt the galleries of San Francisco, and at Cornell University. After a few years of college teaching he moved to Philadelphia, PA, determined to make a success of himself as an abstract artist. Though he had a one-person show at the Philadelphia Art Alliance and was in many juried group shows, and though he had many gallery owners visit his studio, he never was able to convince a gallery to show his work. At about the same time he was getting disillusioned with the status of contemporary art, both in terms of what showed in the better, i.e. not blatantly commercial, galleries and what was written about in the art press. So much of it didn't look like much. It was idea-based. He had a forewarning of his distaste for this type of art when viewing Christo's Running Fence, while he lived in the Bay Area. As well a good friend and fellow student of his at UC Berkeley always exhibited work that required written documentation. He always argued to her that good art didn't need explanations. Guess who went on to become the better known artist? Not Ken! In the years that followed art informed, or more likely deformed, by ideas rose to the fore. That was the state of the art world when he pretty much abandoned it, at least as a manner of making a living. At the same time he became interested in the insects he found in his garden, at that time a community plot north of Northern Liberties in Philadelphia. His interest was primarily scientific. Were the insects good or bad for his garden? To know that he needed to identify them. This in turn required a good dissecting microscope. He bought one and spent a number of years drawing insects that he'd caught viewed under the microscope. This was quite a switch from his large 6'x8' abstract paintings. This proved an interesting, and thought-inducing, contrast to the idea-based art he'd come to dislike so thoroughly. As he developed these drawings he realized the artistic possibilities of nature-based art. He was also getting more involved with birding at about this time. And in 2006 he did his first art with birds as subject. Since then birds that he has seen, never photographs that someone else has taken, have been the subject of his work. He began by using a vigorous drawing method, similar to that he used with compressed charcoal in his abstract work, in drawings with birds as subject. Though there was something appealing about them he also realized how little he knew about the structure of birds. There were too many fudged passages in this work. So since then he has spent many hours sketching from life, trying to get to know birds better. His interest however has never been to do illustrations, especially with a lot of plumage detail. That seems deadly to him. Instead he's tried to find a way to create more abstract works that still remain true to the birds he's seen and the environment in which they live. 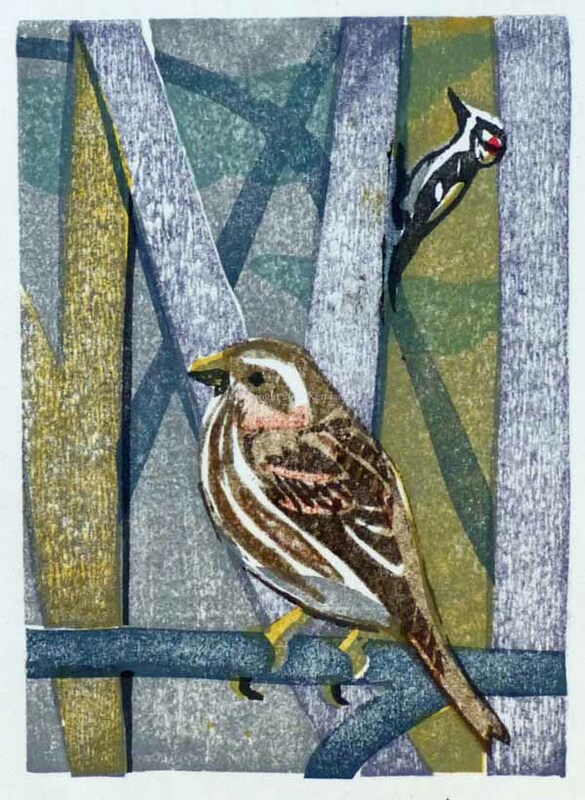 One of the most recent examples is a moku hanga print from 2019 of a female Purple Finch and male Hairy Woodpecker. His primary medium for the last 5 years or so has been relief printmaking, both linocut and woodcut. Since 2017 he has concentrated on moku hanga (traditional Japanese woodblock printing). But painting is what he spent most of his life doing. So he still experiments with water-color and to a lesser extent acrylic. They offer a pleasant relief from printmaking and are often the source of his printmaking images. But at least at the moment printmaking seems the best medium for him.